For those who use the Subaru Loyale (EA82) in a Rude way, either with heavy weights or offroadind too often, I wrote a Writeup years ago, with some Ideas to improve the Suspension on those Old Gen Subies, using parts from other car brands that fits easily on the Subaru Loyale. The Writeup is ~► Here. I Hope that you'll find my writeup, Helpful. When you say "rear coil springs" what do you mean? my 92 4x4 loyale only has the coilover shocks in the rear. Well... the Strut assembly comes with a Shock absorber and a Coil Spring, either the Front and the Rear ones. I was Writing about the Coil Spring on that assembly. The Toyota's Coil Spring is too Stiff for the Subaru's Rear, the Subaru ones are OK but Weak for my Rude / off road \ loaded use of my Wagon, so the Honda ones were Perfect for me, those aren't too Stiff, nor too Weak. Look for Part Number on my Writeup's Link Above. I've received some Questions about that Suspension Mods I've done, via PM; I'll post here the most common Questions along the Answers, in order to Help more people who wants to do these Mods. ... you mentioned the steeper angles on the axels. how much of an increase does it make and how much stress does it put on the axels? that is my only concern with this swap is then going thru axels so quickly because of greater wear on them. Please don't forget that the 4Runner Shocks only have 4" of total Travel, while the Subaru Shocks has 6" ... BUT the Coils Won't let them go much Down, specially with the Honda Coils. The added +/- 2" inches will Stress the Rear Axles to their Maximum, if you want to Do the 4Runner Shocks plus Honda Coils on a 4WD Subie, Without stressing the Angles, you must consider to Drop the Rear Differential a Little. The salesman from the Aftermarket parts store where I purchased those KYB 341232 Shock absorbers, said that those are for the Front of a Toyota 4Runner for the 1998 model year. 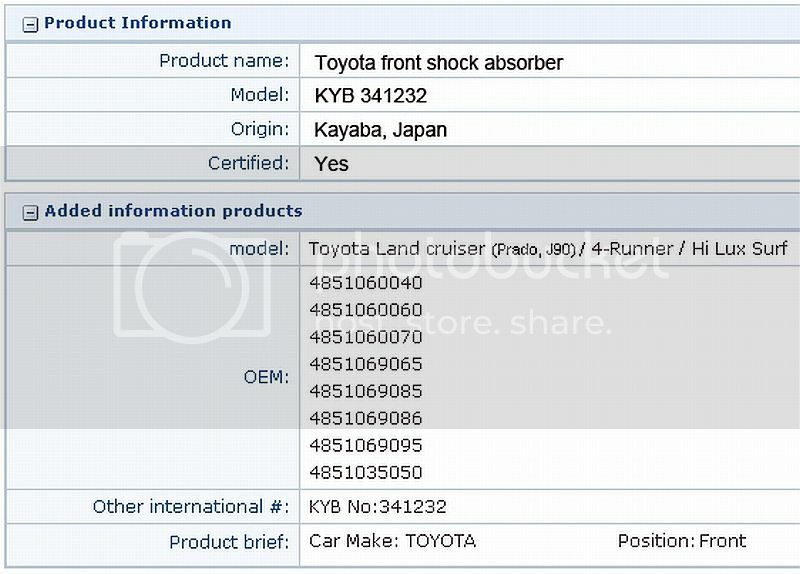 The Following is a Screen Caption of a website that I Saved long time ago, where you can find the Original Toyota's Part Numbers for their OEM Shock Absorbers, which are the Same KYB: 341232 that I Used in the Rear of my "BumbleBeast"
does it matter what engine on a 1998 4Runner...and is there any 2wd 4 runners of this era? Since the same part number was also used on the Land Cruiser Prado and the Hi-Lux Surf, some websites even list it for the Tacoma of the same era... I Believe that it will be fine if you Stick to the Part Numbers Provided. I Searched and Tested the KYB 341232 only, My Subaru "BumbleBeast" Runs very well with those since years ago, despite they has only a li'l more than 4" of Travel (The original Subaru Shock Absorbers has around 6" of Travel) but that short travel is not an issue, because the Coil Springs won't let it go more than 4" under compression. So I Kindly suggest you to stick with the Part numbers given, I can not guarantee to work anything else. What did you use to drop the rear diff to a better height? In my case... I Didn't dropped anything because my Subie is 2WD only, I Bet it is the only 2WD Lifted Subie around, and it Hold up Great with the Local 4X4 clubs' Cars, I do Weekend mountain adventure Travels with them sometimes. At the Bottom of my Writeup, I explain that the 4WD subies must drop the Rear Diff with this mod, because it Lift 2" the Rear. There are Special plates to Drop the Rear Diff that you could buy from the People that does Lift Kits, there are Many of them Here, in USMB, I Kindly suggest to Search in the Off-Road Section; but also you can be creative and build your own plates to drop the rear Diff 2" ... it is Not rocket science. It seems they don't make the kyb part # anymore... here in the states ..can't track it . where did u get it from? ... of Original Toyota Part Numbers could be Useful for you, in order to Buy a Monroe or Rancho equivalent. Just Use the OEM Part Numbers Given, and try RockAuto. For those who don't want to use Toyota 4Runner Rear shock absorbers, the Subaru ones does work great with the Honda Accord's Coil Springs. Originally Subaru Developed two different Rear Shock Absorbers, one seems to be Taller than the other, but the Main Difference is on the Base where the Coil Spring sits: the 2WD version has that base welded to the Absorber's body, Two inches Below the place where it comes welded for the 4WD versions. but suddenly, instead of Making Two different Versions of the Same Shock Absorber, one with the Lower welded Base for the Coil Spring, and Another with it welded 2" up, Subaru reinvented the Rear EA82 Shock Absorber, using an "Adjustable" Base system. Subaru 21007GA471 which is Made by Kayaba, Japan. Those are Sold without their adjustable Base... You must purchase it Separately! I am Glad that my Subaru "BumbleBeast" runs on 'yota 4Runner Shock Absorbers, as you can read, ~► Here. 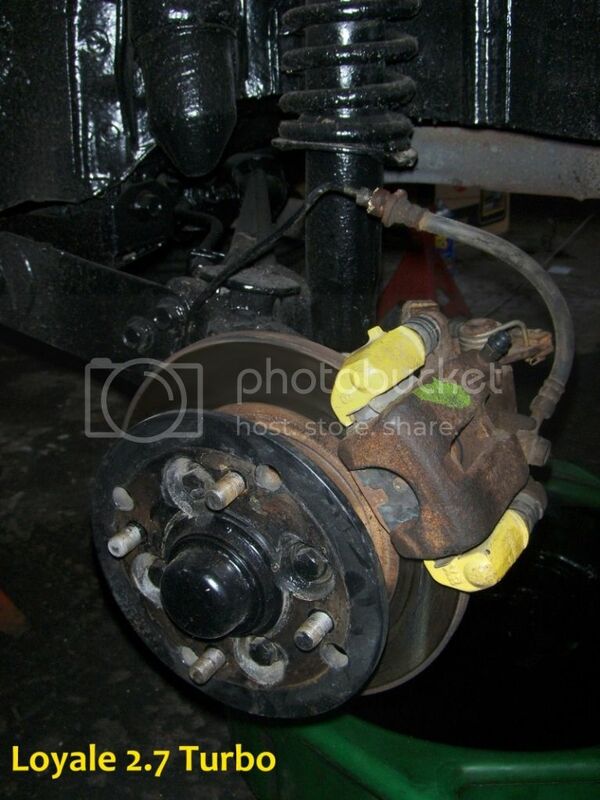 Hi, Could I cut the Honda springs to work with the Toyota shocks for the rear of my1986 4wd Subaru? if so, how much do you think I would need to cut off to keep standard height? Thanks. Yes, you could cut the Honda Coil Springs to keep the Original Height... but it doesn't make much sense, since you can install the Original Subaru coil Springs along the Toyota Shock Absorbers and thus mean to Keep the Original Height. hey mate i have read through a lot of your threads i am trying to do the front and back suspention mods with slight variations as i am from australia, eg i will be using KING SPRINGS instead of the moog nappa brands. i i have a thread going over on AUSUBARU.com http://www.ausubaru.com/forum/showthread.php?t=24071 i will paste some stuff from there. KDFS-14 are the ford laser springs that will be going in the front, Has anyone fitted a new pair of these not second hand? And the same for Brand new KHFS-58 the Honda civic springs that will be going in the Rear? and also to try and put less pressure on the spring seat with dampers that actually work unlike the ones i have in atm.. The Front 2 Coils HONDA CIVIC 1987-1993..
he said the KSRS-03* would actually be stiffer because 9.5turns is stiffer than 11turns..
i asked him twice to make sure i didnt miss hear him but thats what he said! i can see how the extra 100 mm on the rear will lift..
but only an extra 25mm on the front and a loss of 45lbs carring weight i cant see how they will sit any higher if not a lot lower..
have i just wasted money on new springs that will do less than before!? Look at my Writeup for part Numbers. 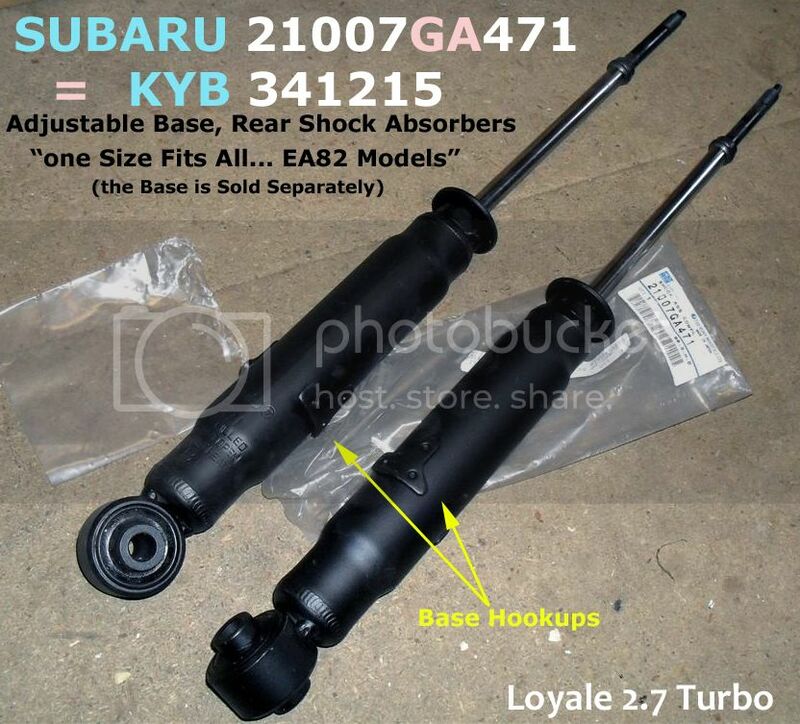 Subaru had a third shock for the ea82, 21007GA280 (Rear, would imagine fronts are different as well). Spring perch is at the very bottom of the shock and the shaft is machined at the end. 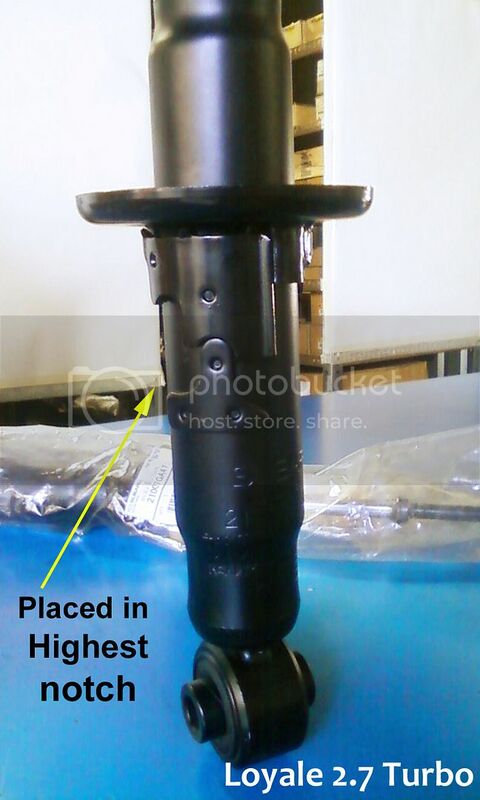 Its like that to accommodate for this hydraulic cylinder that slips over the shaft above the spring top hat. 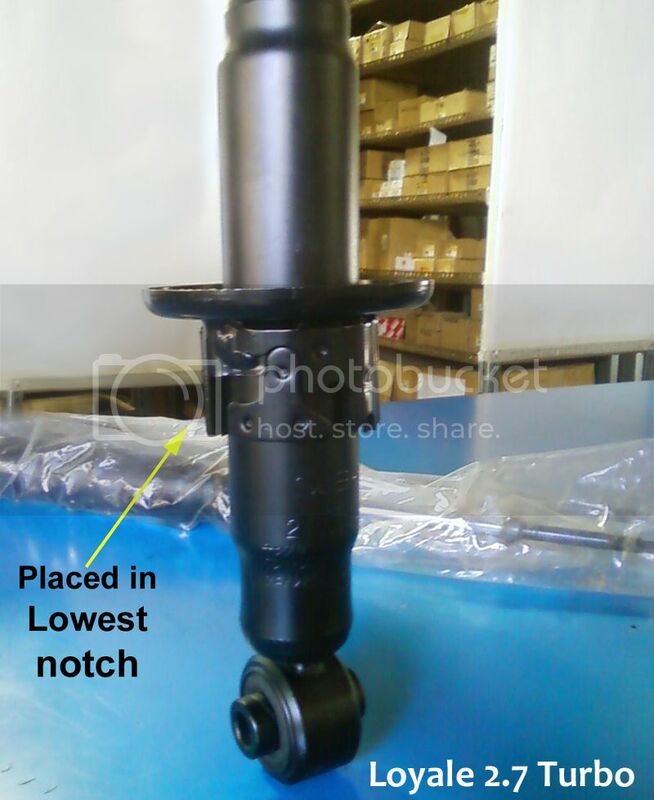 The hydraulic cylinder needs to seal around the shaft in order to work. And finding a replacement is proving very fun, ahah. Aren't those the ones used on the models with Adjustable Height, "Pneumatic" Suspension? That is what I thought until i took one off and pressed the button. Definitely had fluid coming out. Has a filler under the hood as well, going into guard. The Height Adjustable Suspensions were Banned in the United States from 1974 to 1981, due to the Stringent interpretation of Passenger vehicle bumper height regulations by the U.S. government agency NHTSA. Subaru was one of a few manufacturers who offered such feature in the United States, after the ban was lifted, on the Subaru XT, the gen III Subaru Leone wagon (EA82), and the Subaru Legacy for a short time, but instead of Hydraulic, those newer suspension controls, were Electro-Pneumatic. 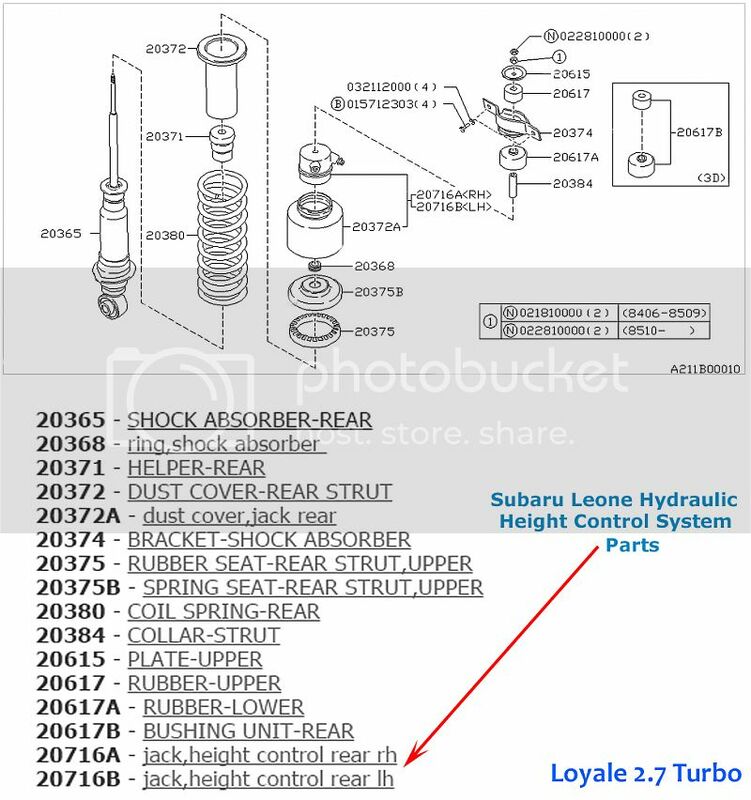 I knew that Subaru offered Suspensions with some sort of "Height" Control, on certain "Top of the Line" pre 1985 models in some markets of the World except USA, due to said Ban; BUT those older suspension controls were Hydraulic instead. But as far as I know, it was Not Exactly a Height Control, but a Load control, in which by a Switch on the Dash, the Ride became a little higher but Harder, like in "Sport" mode of the old toyota celicas, with the Hydraulic system aid / Pressure; or the Ride becomes Softer and lower when the Hydraulic assistance is turned off. I never saw any hydraulic assisted suspension "in Person" but I heard about that in Honduras long years ago, the old Subaru Mechanics from the local Subaru dealer's repair shop, told me about such feature which came in few "Fully Optioned" Wagons. Thank you for sharing the actual parts' Photos, you're so Kind. So I have to fix my XT6 because the rear suspension is failed. I have 4WD, so a rear strut for moderate offroading would be the toyota 4 runner 4x4 front strut with new loyale wagon rear springs? I have heard the xt6 FWD struts are a bad choice for replacing the original xt6 air ride. I read that they handle poorly and ride terrible. I do not want to modify my knuckles though, as I have read may be necessary to use say later Impreza struts. so I may try to peice something together like you have done. I do not want to increase the ride height, really, except on the strut that is popped!! I wanted to ask if the XT6 front 4wd strut is any different than your original loyale strut, and in what way? Also, when you were sourcing the front springs, you mentioned that you took the old coils with you, were they the loyale 2wd versions? ... you mentioned that you took the old coils with you, were they the loyale 2wd versions?